HAHA!. Printing that one for the bulletin board. Yep. 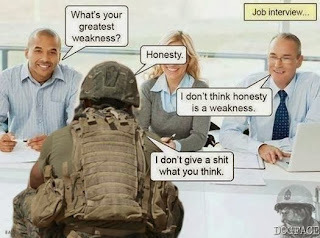 I've had job interviews like that. One question I had: "What's the most stressful situation you've ever been in?" Me, "I had a flight deck blow up in my face, destroyed nine airplanes and killed three guys." Interviewer, "Uh, so what did you do?" Me "I grabbed a hose and we put it out, not much else we could do." My favorite question though (which relates to the above) "Where do you see yourself in five years?" I actually started laughing and they asked why it was funny. "Well," I said," I could say that I see myself as your boss in five years, or moving up the ladder, but truthfully I have no idea. Five years ago I didn't see myself living in Seattle, yet here I am."